Like Coal Mine Canyon, its close neighbor to the west, Ha Ho No Geh Canyon is one of several shallow, branched, relatively wide tributaries of Moenkopi Wash (Blue Canyon), which drains a large area of the Navajo and Hopi reservations before joining the Little Colorado River near Cameron. 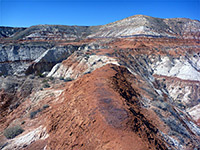 The flat, thin-layered rocks in this part of the Colorado Plateau have a range of contrasting colors and textures; individual strata may be white, black, red, yellow and many other shades, and along the canyon edges have eroded into cliffs, mounds, slot-like gullies and tall spires - classic Southwest badland scenery, which for Ha Ho No Geh Canyon extends for some 15 miles across the surrounding level, sandy, treeless plains. This section of the reservation is very little habited, crossed only by a few tracks leading to occasional settlements, and while most parts of the canyon are far from any road, the south (upper) end is readily accessed from Hwy 264 and may be viewed by walking along the western rim, since although only 200 feet deep, with partly sloping sides, some layers are sheer, and there do not seem to be any easy routes down for at least a mile, until the drainage widens somewhat. This upstream end appears to have the best scenery since the wash is narrower, the walls steeper and the hoodoos more spectacular, but doubtless there is much to discover in the more remote areas further downstream. 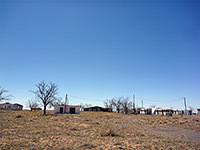 The closest approach of Hwy 264 is half a mile east of the derelict Coal Mine Mesa, once a Navajo trading post; one suitable parking place is by a gate on the north side, immediately west of some powerlines across the road, though it might be possible to drive nearer along the faint vehicle tracks heading north. From the highway, low cliffs bordering the canyon are visible to the northeast, but most of the land ahead is flat, sandy and featureless. The western rim is reached after a walk of 1.3 miles northeast, and from here stretches a great expanse of cliffs and banded badlands along both sides of the ravine. 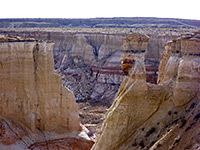 All the upper parts of the canyon seem to be lined by a vertical band of orange/yellow sandstone up to 200 feet high, above the lower grey/red badlands, but these cliffs recede gradually over the next mile allowing routes down, but the lower hills are also steep-sided, and somewhat unstable, formed of soft, clayish earth and spit by deep, branched ravines, so even here it is difficult to reach the valley floor. 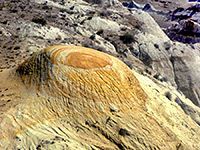 Many areas of the mud hills are embedded with colorful fragments of mineralized rock, presumably from covering layers long-since eroded. The hills also become less steep further north, as the canyon continues to widen, thus eventually allowing a way down to the canyon floor - this is now nearly a mile wide, and flat, apart from occasional residual mounds, but the best scenery remains along the edges. 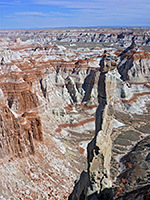 Tall pinnacles and other large, isolated hoodoos are found in some places, but most parts have just the grey/yellow badlands and cliffs, crossed by bright purple/red bands. 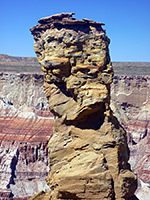 In general, the best photographs of the canyon seem to be wide views rather than details of individual features, unlike, for example, Bisti Badlands in New Mexico.